It’s 11 o’clock on an unseasonably hot September morning, and long lines of elementary school students walk single-file through Hale Hall. They are on their very best behavior — they chatter, they wiggle, like characters in a modern-day Madeline — trying their best to contain their excitement. But it’s a school day, and they’re on their way to learn about digital painting, animation, zines, comic books, digital art and flip books from comics creators from around the country. Today is SÕL-CON: The Black and Brown Comix Expo, and today, these are the luckiest comics fans in the world. I am looking for Frederick Luis Aldama, Arts and Humanities Distinguished Professor in the Departments of English, and Spanish and Portuguese and co-creator of SÕL-CON. When I emailed Aldama to schedule this photo shoot, he responded with characteristic warmth and enthusiasm: “Of course! Any time!” This year’s event — now in its third year — drew more than 250 participants and 30 exhibitors. Throughout the day, K-12 comic enthusiasts participated in a series of workshops while older comics fans and scholars attended panel discussions, explored the expo and talked with the creators themselves. 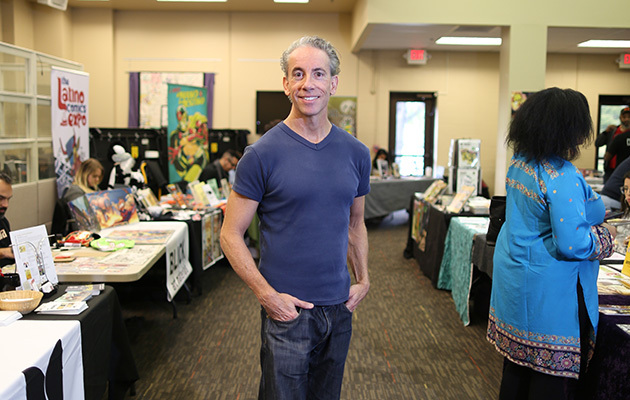 In addition to spearheading SÕL-CON and HumCog, Aldama also teaches courses on Latino and Latin American cultural phenomena, including literature, film, TV, music, sports, video games and comic books. I found Aldama in the doorway of the expo room flanked by giddy students and frantic volunteers. “Do you need me?” he asked, grinning. And we were off, speed-walking to the zine-making workshop where the photographer had set up shop. Behind us, comics artists diagrammed frames and discussed techniques for building dynamic stories. For the briefest of moments, the children grew quiet, the room calmed, we all took a breath and the camera flash went and went and went. And then Aldama was off again — maneuvering to the front of the room to grab some extra paper and pencils to take back to the volunteers. Before he could make his delivery, however, we passed another line of students in the hallway. “Let’s take a picture together!” he exclaimed, and the students excitedly gathered around. He never stops. Witnessing Aldama navigate this controlled chaos, with the ease and grace that he manages each encounter, it requires no stretch of the mind to imagine that he may have lived this day hundreds of times before, memorizing the moves, calibrating each step and perfecting the timing in order to execute it all with elegance and joy. Three months earlier, I sat at a table in this same room with a group of middle and high school students eating tacos and talking about brain dissection. It was the last day of the Humanities and Cognitive Sciences Summer Institute (HumCog). Now in its fourth year, HumCog drew 47 students from around the country — mostly from Columbus, and mostly from the Latinx community with whom Aldama has developed close ties through his outreach program, LASER — to come to Ohio State for one week and enjoy a veritable buffet of what the College of Arts and Sciences has to offer. More specifically, however, they learn that the intersection of the sciences and humanities can teach us something foundational about what it means to be human. HumCog student scholars toured the Billy Ireland Cartoon Museum, participated in lectures and labs with world-renowned Ohio State faculty, engaged in group discussions and collaborative research projects and, yes, even dissected a brain. 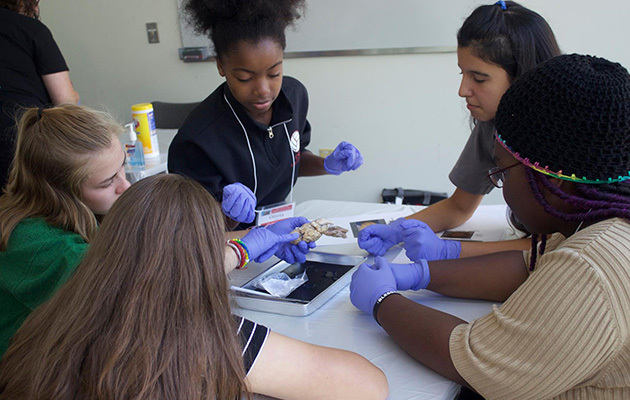 Students in the Humanities and Cognitive Sciences Summer Institute dissect a brain. Aldama is the founder and co-director of HumCog. A ringmaster, really. A showrunner. And it is through HumCog that one can get the most complete sense of what unifies his teaching, research, outreach and advocacy. Because, after all, it’s difficult to summarize a man whose selected curriculum vitae is 23 pages long. A man who has published more than 30 books on topics including sports, comics, film, teaching, poetry, narrative theory and the humanities. A man who is dually appointed and who has founded, co-founded, directed, co-directed, writes, edits, speaks, travels and mentors as prolifically as he does. At a time in their lives when most middle and high school students are being encouraged to put a pin on their futures — narrow down possible majors, career options, etc. — HumCog invites them to do exactly the opposite. To instead, cultivate interests in the arts and the sciences. To ask questions about the world and their experiences in it and launch thoughtful investigations. To try new things. To relish complexity. To dream big and loud and often. In his closing message to the HumCog scholars, Aldama reiterated the importance of keeping their brains flexible and how the practice of being creative can help them imagine different worlds, different realities and even different futures for themselves.